The Lost Boys was one of the first horror films a lot of us saw. It was pretty scary in places, but was gentle enough for teens to enjoy without it being too much – it was certainly no Texas Chainsaw Massacre! 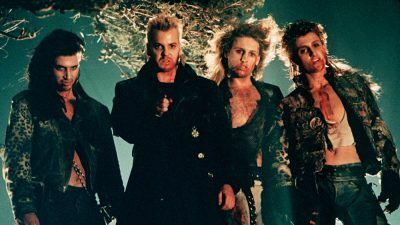 The Lost Boys was great in that it used teens in the lead roles so that its audience could relate to it and picture ourselves being involved in the same, or a similar, story. In case you have forgotten or not seen the move in a while. It follows the story of a mother and her two sons after they move to a new small town in California. The town is full; of bikers and we soon start to see some mysterious deaths taking place. One of the sons makes friends with two other boys who claim to be vampire hunters. The other brother is drawn into the gang of bikers by a hot girl. Before long the older boy is sleeping all day and displaying some unusual behaviour and from there things really start to get good! The inspiration for the movie’s name came from the characters of The Lost Boys in J.M Barrie’s stories about Neverland, who like the boys in the film are desitined to never grow up. Day Magazine described the core of the The Lost Boys as “organised around loose allusions to Peter Pan” and the tension surrounding the family and modern-day teenagedom. The movie was originally conceived as a vampire reimagining of The Goonies, and was aimed at 13 to 14 year olds. However, when director Joel Schumacher came on board he decided to make the film more sexier and more mature, bringing in scriptwriter Jeffrey Boam to make the characters older and the writing more adult. On the film’s cast, Schumacher said he had: “one of the greatest in the world. They are what make the film.” Many of the young cast were quite unknown at the time. The director envisioned the character of Star as being a waif-ish blonde, similar to Meg Ryan.